In case you didn't already blue yourself with excitement, Arrested Development is back after years of hiding in the attic. 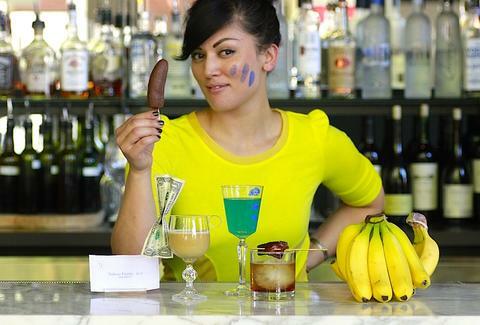 To help you get through the inevitable binge-watching of the entire fourth season, Erica Namare -- noted Teamocil addict and bartender at Portland's esteemed 23Hoyt (no curly fries, there) -- has taken to the banana stand and come up with three AD cocktails that contain no vodka, so you don't need to drink them super-quickly so they don't go bad. But you totally should. 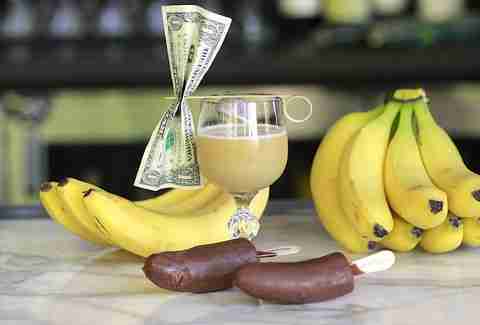 Hack off some banana, then toss it in a shaker w/ the honey. Crack a whole raw egg into the same shaker after making sure there's no mayonnaise on it. Pour in all the liquor, then shake like a dancer at the Queen Mary. 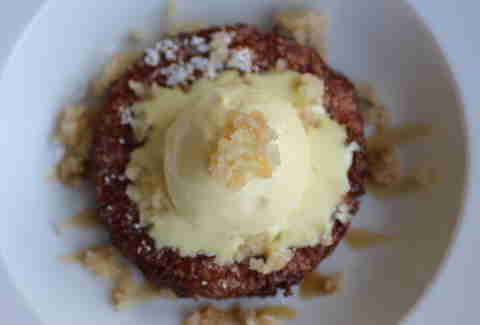 Strain the mixture so you don't choke on the banana chunks, then shave some nutmeg on top. Skewer a little stick through a dollar bill, then balance it over the top. Keep it away from fire, as flames + banana stands can be disastrous. You can finally make the Domesticated Lindsay Bluth classic at (model) home!! Pour the bourbon, Cynar, and vermouth over ice (and don't forget to take his card for future catering needs). Add the peppercorns and stir vigorously. 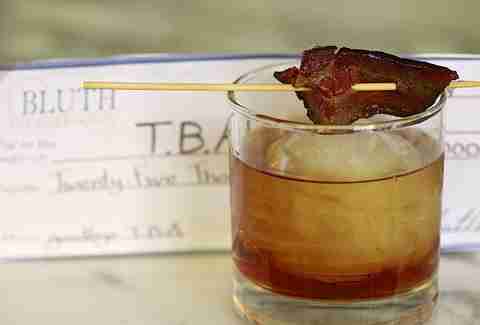 Add the bacon tincture to create the hammy goodness, then top with a nice, fat chunk of Atkins-friendly candied bacon. 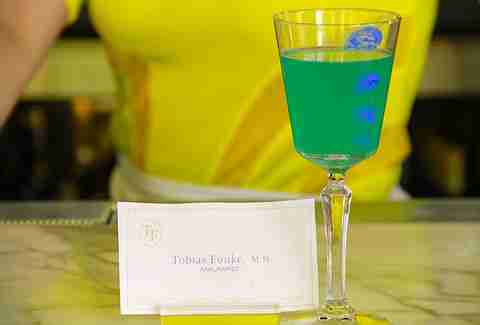 "I'm Afraid I Just Blue Myself"
And here's a bonus breakfast recipe to pair with those drinks! The Lucille by Chef Ryan Leinonen of TrilliumThe vodka/toast combo is a part of any Lucille's balanced breakfast (except Lucille 2), and now it can be part of yours, with a few added ingredients to make it taste delicious. Don't worry though: there's still plenty of vodka in it. Mix vodka and ice cream in blender. Pour the mixture back into the ice cream pint container and refreeze. Cut small pieces of caramel and bake them on a cookie sheet at 300 degrees until slightly burnt; let cool, then scrape into a bowl and put aside. Pause momentarily to admire the seal Army gave you for marksmanship. Toast the bread and slather it with butter, then sprinkle with salt and sugar to taste. Cut the bread into croutons. Scoop the vodka ice cream on top; sprinkle the caramel and strawberry Pop Rocks over it. If using a surrogate, make sure the head-mounted camera equipment is up to snuff.